Thieves Den is a, soon to be Kickstarted, worker placement game from Alice Davis, who is also the designer of the cute and popular card game Kitten Clash. The game is to be published by Daily Magic Games, who have a reputation for creating exceptionally attractive games that feature superb build quality, so even though the version I have been testing is clearly an early promo, it is already entirely playable. With so many games Kickstarting at this time of year, let’s find out if Thieves Den is worth your hard earned cash. Whilst most people will be familiar with worker placement games as a concept, Thieves Den features a number of unique differences that set it apart from the crowd. Games of this kind usually involve placing coloured workers that represent the player faction, tribe, hive, nation or whatever other kinds of collective group is thematically relevant to the game, onto spaces on the board. The first notable difference about Thieves Den is that all workers (thieves) share a colour and do not represent any specific player exclusively. Instead, the players each begin the game with a set number of thieves and the first part of each round focuses not on the workers themselves, but on drafting and placing new locations that expand and change the board state. The locations placed can then be visited by thieves from any player (regardless of who placed the location) which results in a benefit being given to both the visiting thief and the owner of that location. Another twist is that at the end of the round, players will collect thieves placed on the locations that they drafted earlier, adding them to their own player mat for use in the next round. There is a standard action to trade treasure for thief tokens (but it’s quite expensive) so using locations to entice your opponents to steal from them is actually a necessary part of the game. Assessing components is always a challenge when dealing with preview copies of board games that are yet to be finalised, but it does help when the game in question is published by a company as meticulous as Daily Magic Games. 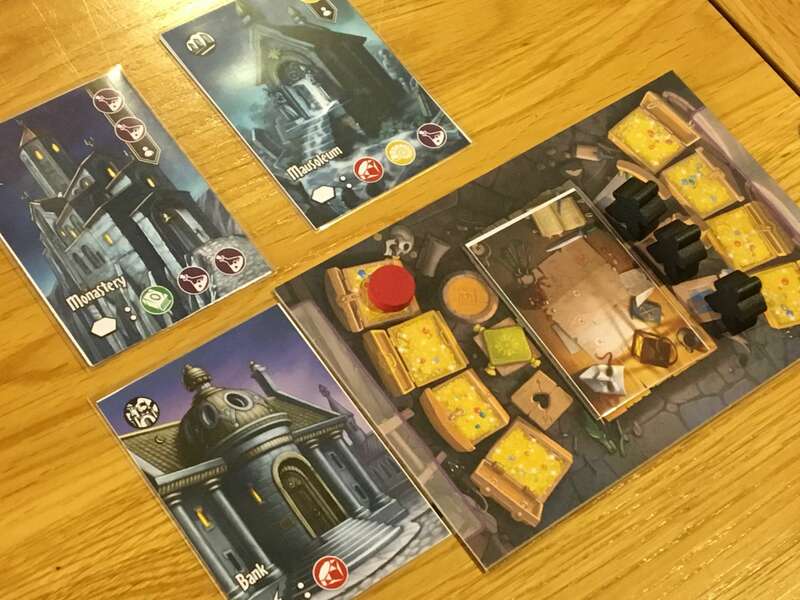 The notable point about the version of Thieves Den that I tested (as shown in the photographs) is that the art appears to be final (or perhaps nearly final) but the actual materials are not. As such, the cards I’ve been using were hand-cut paper inserted into sleeves, whilst the board is an early production print. The thief meeples may well be in their final design, but the other wooden tokens (treasures) are lacking what I suspect will either be a printed jewel motif or a sticker. I’m only speculating, but it feels like there may be some stretch goals for this Kickstarter to include moulded plastic tokens to match the different kinds of treasure, for example. As it stands right now, I really like the art style used in Thieves Den. The board itself is a kind of pastel blue, which I am confident is used to represent the fact that most of the work the thieves do is done during twilight hours. The range of fence cards is broad and the fences themselves are a diverse mix of men and women from several racial backgrounds. Some of the components in my copy (player boards and to a lesser extent the main board) made it hard to pick out specific details, but I think that will be corrected before the final print run. The instruction manual is clearly not finalised yet, but the rules themselves are explained simply, with useful examples. 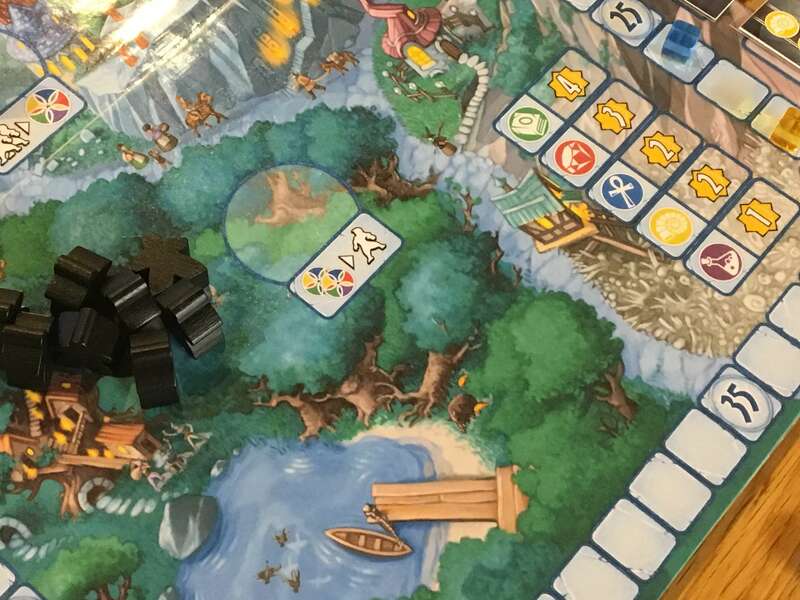 There are a few nuances for how the game is set-up and played differently for two players versus the three and four player modes around which it is clearly focused. Judging by past efforts from Daily Magic Games, I don’t expect the finished booklet to be anything less than superb, which is also true of the quality that I expect from the remaining components as well. Turns in Thieves Den are relatively fast-paced and, for the most part, they work a lot like almost any other worker placement game with those unique exceptions that I described earlier. Before the actual deployment of the thieves the players perform a round of drafting known as the scouting phase. Assuming a three or four player game, the players each draw four location cards which they will then assess and choose one of. Everyone then passes the three remaining cards in their hand to their neighbour, chooses one, passes two and then takes one of the final two passed to them. The final, unchosen card in every hand is then discarded. Some locations feature a lightning symbol and, at this point, all players holding one must place them and take the benefit of them immediately before placing these cards aside. All other location cards are then placed in front of the player that chose them. Each location features one or more worker placement slots that become active for the upcoming round, but as I said earlier, they are not exclusive to the player who places them – except the lightning cards. 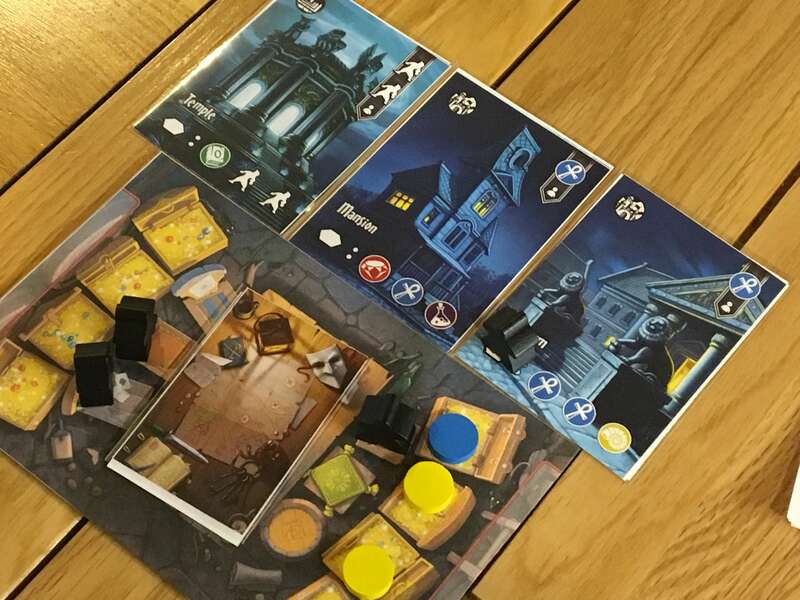 When locations are all set, players will take thieves from their own player mat and begin to take actions with them, placing one and then passing to their neighbour until everyone has either used all their thieves and taken any other actions or passed. There are six actions available, including; stealing from a location, fencing treasures, claiming a power tile, converting treasures into points, burgling treasures and recruiting more thieves. Each of these can be more or less relevant to the players depending on what treasures they already have, how many thieves they need to enact plans for the next round, which fences are available to sell treasures to and so on. A cleanup phase takes place after the actions have been completed. Because all thief tokens are the same colour and players only retrieve the workers that were placed on the locations in front of them, they lose any thieves placed elsewhere, but gain any thieves placed directly in front of them. Thieves placed on the main board are simply returned to a shared supply and if you want to buy one, you’ll need to trade in two treasures – which are also the currency for scoring points. After three rounds of placing thieves and taking actions, the game ends. Thieves Den is relatively lightweight and fast, but it makes two or three minor tweaks to the otherwise normal worker placement formula that really enhance the experience and make it feel unique, but also pleasingly familiar. Drafting locations, for starters, is mechanically simple, but it also feels quite gamey to strategise about which locations to place – an element of bluffing and misdirection can be factored in, which is very fitting given the subject matter in Thieves Den. Thieves Den is very different to the other worker placement games that I’ve played, not only because of the drafting and how thieves move between players so fluidly but also because it is much quicker and faster than most. It’s a very simple game to learn and teach, but there are a lot of strategies spread across several decisions – how to draft when to use an opponent’s location, when to pass your turn in order to ensure that you have a next turn and so on. 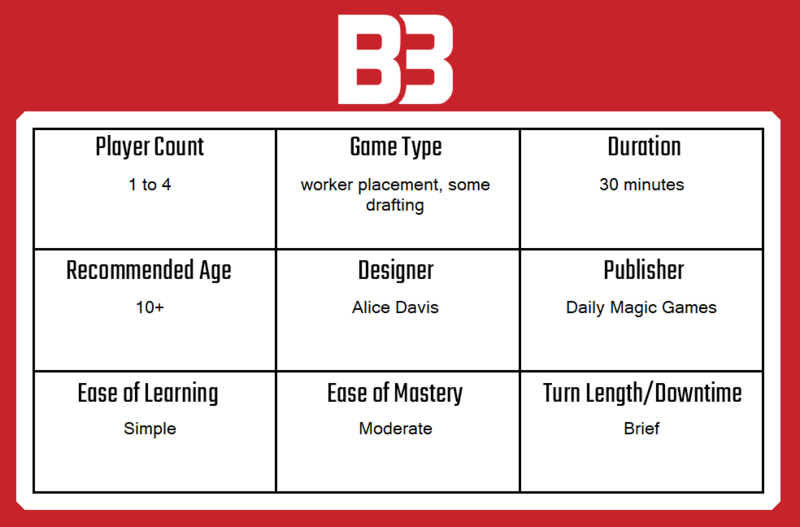 The game is much better with three or four players than it is at two, and I do feel like it might be possible for the game to accommodate some more rules or additional features thanks to its core simplicity. 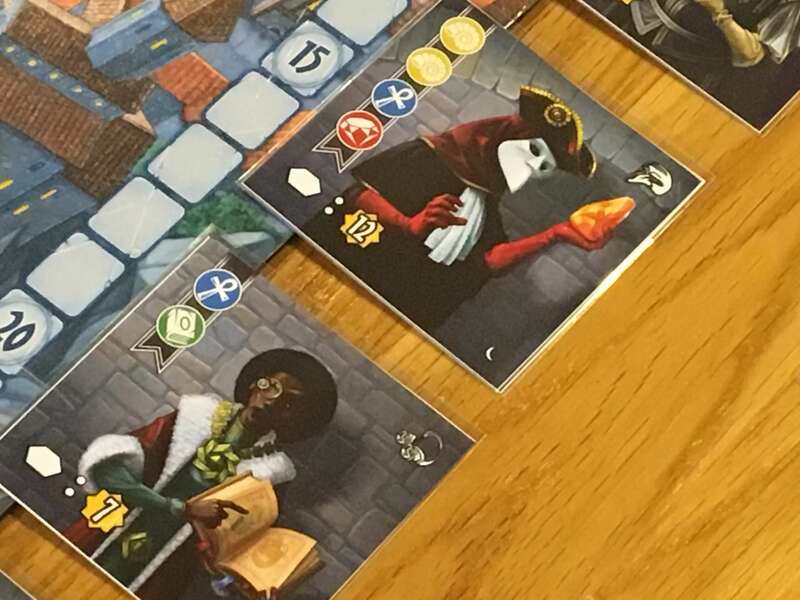 Clearly, adding more would detract from the simplicity that I like so much so I am sure that the designers know better than me, but currently, I wonder if Thieves Den will have long-term staying power. Even if it doesn’t, well it’s not like it needs to replace another game in your collection because it does so much new in its own right. As a result, I think Thieves Den is worth backing, especially if you’re looking for a quick, simple, interactive worker placement that has a number of unique and fun mechanics. The Kickstarter for Thieves Den isn’t live yet and there isn’t any detail on the Daily Magic website, but you can access the latest news here and the Kickstarter preview link is here.